Although it’s uncommon, breast cancer can occur in men, and it can be serious. 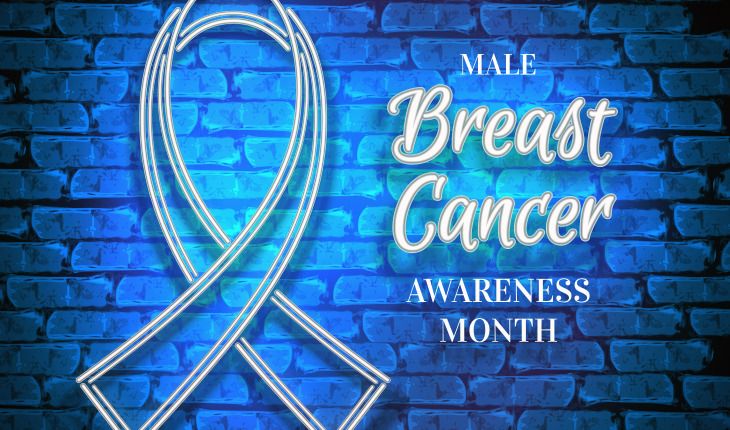 According to the American Cancer Society, about 2,350 cases of invasive male breast cancer will be discovered in 2015, and about 440 men will die of the illness. Those figures highlight the importance of knowing as much as possible about male breast cancer. Male breast cancer is a disease in which malignant cells form in the tissues of the breast. Radiation exposure, high levels of estrogen, and a family history of breast cancer can increase a man’s risk of breast cancer. Male breast cancer is sometimes caused by inherited gene mutations (changes). Men with breast cancer usually have lumps that can be felt. Tests that examine the breasts are used to detect and diagnose breast cancer in men. Certain factors affect prognosis and treatment options. Breast cancer may occur in men at any age, but it is usually detected in men between 60 and 70 years of age. Male breast cancer makes up less than 1% of all cases of breast cancer. The genes in cells carry the hereditary information that is received from a person’s parents. Hereditary breast cancer makes up about 5% to 10% of all breast cancers. Some mutated genes related to breast cancer are more common in certain ethnic groups. Men who have a mutated gene related to breast cancer have an increased risk of this disease. There are tests that can detect (find) mutated genes and are sometimes done for members of families with a high risk of cancer. Estrogen and Progesterone Receptor Test: Measuring the amount of estrogen and progesterone (hormones) receptors in cancer tissue. If cancer is found in the breast, tissue from the tumor is checked in the laboratory to find out whether estrogen and progesterone could affect the way cancer grows. The test results show whether hormone therapy may stop the cancer from growing. HER2 Test: Measuring the amount of HER2 in cancer tissue. HER2 is a growth factor protein that sends growth signals to cells. When cancer forms, the cells may make too much of the protein, causing more cancer cells to grow. If cancer is found in the breast, tissue from the tumor is checked in the laboratory to find out if there is too much HER2 in the cells. The test results show whether monoclonal antibody therapy may stop the cancer from growing. After breast cancer has been diagnosed, tests are done to find out if cancer cells have spread within the breast or to other parts of the body. There are three ways that cancer spreads in the body and cancer may spread from where it began to other parts of the body. In stage IIA, no tumor is found in the breast or the tumor is 2 centimeters or smaller. Cancer (larger than 2 millimeters) is found in 1 to 3 axillary lymph nodes or in the lymph nodes near the breastbone (found during a sentinel lymph node biopsy); or the tumor is larger than 2 centimeters but not larger than 5 centimeters. Cancer has not spread to the lymph nodes. larger than 2 centimeters but not larger than 5 centimeters. Small clusters of breast cancer cells (larger than 0.2 millimeter but not larger than 2 millimeters) are found in the lymph nodes; or larger than 2 centimeters but not larger than 5 centimeters. Cancer has spread to 1 to 3 axillary lymph nodes or to the lymph nodes near the breastbone (found during a sentinel lymph node biopsy); or larger than 5 centimeters. Cancer has not spread to the lymph nodes. In stage IIIB, the tumor may be any size and cancer has spread to the chest wall and/or to the skin of the breast and caused swelling or an ulcer. Also, cancer may have spread to : up to 9 axillary lymph nodes; orthe lymph nodes near the breastbone. Cancer that has spread to the skin of the breast may also be inflammatory breast cancer. Click here to see the section on Inflammatory Male Breast Cancer for more information. Reprinted courtesy of the National Cancer Institute (www.cancer.gov).